The ornate wrought iron gates which welcome visitors to the Gardens stand 16’ (4.88 m) high and 21’ (6.4 m) wide, and bear the coat of arms of the city of Halifax, “E Mari Merces”, meaning wealth from the sea. They were originally purchased from the Saracen Foundry in Scotland for the Arched Pavilion, which was the main entry point to the Gardens in 1890. The gates were moved to their present location on the southeast corner of the Gardens in 1907, when the perimeter wrought iron fence was installed. Destinations of choice for wedding and graduation photos, the upper bridge, and the less famous lower bridge were built in 1911 to replace wooden bridges, which crossed the stream and ponds. Both are made of concrete, with elaborate balusters and concrete urns on the four corner pedestals. While the upper bridge has a slightly arched deck, the lower bridge deck is flat. The upper bridge bears a plaque commemorating the bravery of Inspector Francis Fitzgerald, a native Haligonian and member of the RNWMP (The Royal North West Mounted Police). to keep the lines sharp. 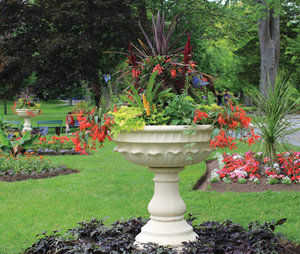 The Halifax Public Gardens contain two carpet beds used annually to commemorate special events. and lots of picture taking. In 1887 (the year the Bandstand was built), the estate of chief justice Sir William Young donated three concrete statues and six urns from his own garden, to his beloved Halifax Public Gardens. Ceres, the Roman goddess representing agriculture and fertility; Flora, the goddess of flowers and spring; and Diana, the goddess of the woodland and wild animals, were installed along the Petit Allée, although vandalism has caused Diana’s removal. the Bandstand within the geometric beds. They were re-cast from the originals, and back in the Gardens 2014. This will complete the very successful Victoria Jubilee Restoration Campaign. The newly restored (2011) bandstand was built in 1887 to commemorate Queen Victoria’s Golden Jubilee. 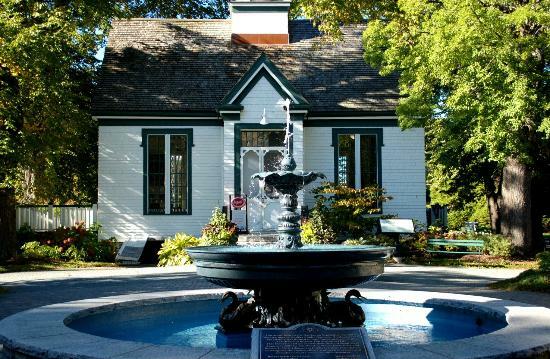 German-born Henry Busch, a Halifax resident, designed the compact, ornate wooden bandstand. It has been a venue for concerts and been the focus of social events for over 125 years. as the Halifax Public Gardens in 1867. The 32 geometric geometric beds, a common element of Victorian gardens, pre-date the bandstand. During the summer these floating beds, planted in traditional Victorian annuals, provide exuberant colour, and complement the intricately carved wooden trim of the bandstand. Originally built as a meeting hall and storage area for the NS Horticultural Society in the late 1840’s, Horticultural Hall is the oldest part of the Halifax Public Gardens (along with some of the elm trees surrounding it). Today it houses the lovely Uncommon Grounds Café where visitors can enjoy their coffee and snacks inside or on the terrace surrounding the building and can take the opportunity browse through the books, postcards, clothing and other Public Gardens themed items. Be sure to sign our guest book. 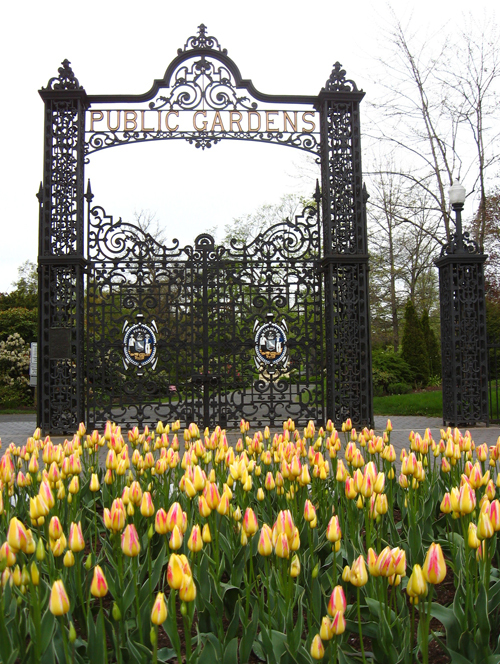 The latest addition to the Halifax Public Gardens was built in 2004, with funds raised by a 24-hour radio campaign organized by the Public Gardens Foundation, following the devastation caused by Hurricane Juan. 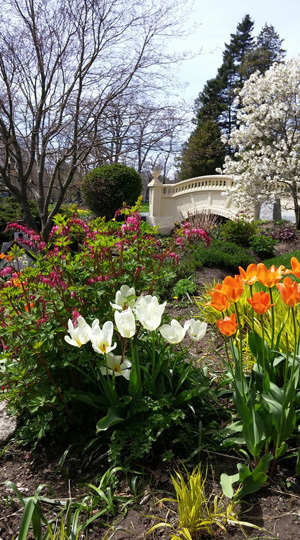 More than $1,000,000.00 was donated by the citizens and local businesses of Halifax, who rallied to support the reconstruction of their beloved Public Gardens. At the centre of the plaza is a fountain whose lower basin is held up by five lovely swans. On either side of this fountain are two new trellised buildings housing family washrooms. The Victoria Jubilee Fountain was added to the Gardens in 1897 to mark Queen Victoria’s Diamond Jubilee. It is a classical-style fountain with a Corinthian column rising from a heavy formal basin to support the nymph Egeria. Her name is an eponym for a female advisor or counselor. She is surrounded by four water babies riding on sea serpents. The Fountain sits in the centre of themost axially symmetrical part of the Gardens. On four sides of her, equally placed, are serpentine and scroll beds which have existed for over a century. 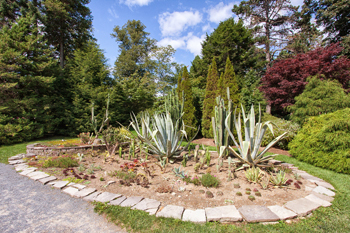 These shaped beds are densely planted in annual plants, whose purpose is to display the shape of the beds rather than the plant material. 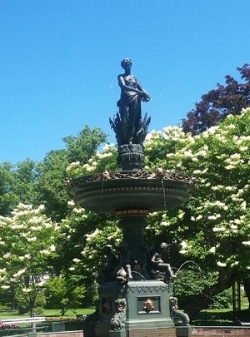 During 2012, the Diamond Jubilee year of Queen Elizabeth II, the Nymph fountain underwent extensive restoration, partially funded by donations to The Friends of the Public Gardens’ Victoria Jubilee Campaign. This man made pond is named after a young Irishman who was hanged on its banks and whose murder conviction was later questioned. Griffin’s pond was once part of a natural watercourse (Freshwater Brook) that flowed through the Gardens. Over the years it has morphed from a source of power for several industries in 19th century Halifax, to be a stopping place for migrating birds with regular flyovers by cruising ospreys. Richard Power softened the square shape of the pond, sloping and scalloping its banks into a more natural shape. 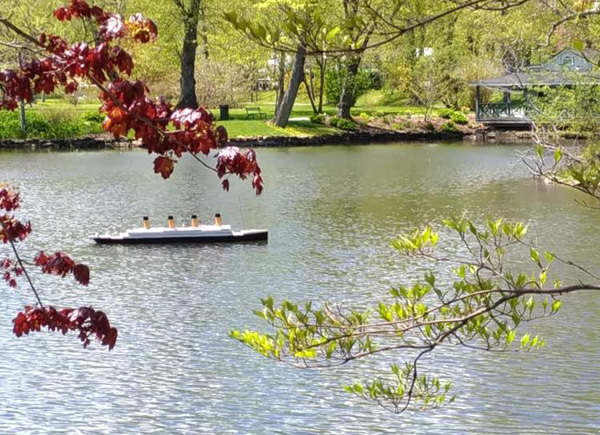 Since 1994, a model of the Titanic, donated by the Maritime Ship Modellers Guild, makes its summer anchorage on Griffin’s Pond. This follows a long-standing tradition of displaying ships’ models in Victorian gardens. Erected in 1903 to commemorate the service of Canadian soldiers in the South African war, the figure at the top of the fountain was modelled from a photograph of a local Canadian Mounted Rifleman. He is supported on a Corinthian capital surrounded by four cranes standing amid daffodils. Beside the fountain, stands a spectacular Weeping European Beech (Fagus sylvatica Pendula), and a ring of Ulmus glabra ‘Camperdownii’ (Camperdown Elms), one of which was donated by the family of a Canadian soldier who died during the Boer War. Once know as the swan enclosure, this site has been the home of swans and geese since King George V donated the first pair of swans to the Public Gardens in 1926. After the death of Horatio (2008), the last surviving swan, Flora and Finnegan, a pair of Toulouse Geese, became the new residents of the bird enclosure. Flora has become a widow after the sudden death of Finegan, and now resides with her good friend Diana, delighting visitors with their supple, gyrating necks. During the winter months they take a short, winter vacation at a wildlife sanctuary.